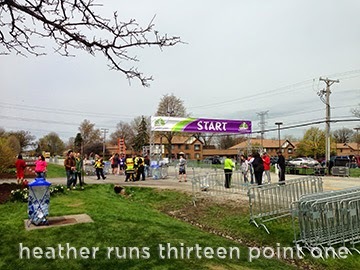 The First Midwest Half Marathon was held on Sunday, May 4. 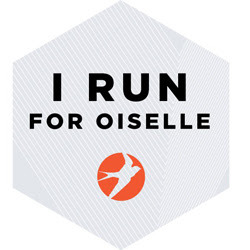 This race holds a special place in my heart, as it was my first half marathon back in 2012. Even though that race didn't go as planned, I was so happy to cross the finish line of my first 13.1 mile race. Participants were able to pick up their packets and goody bags at the Palos Area Chamber Expo and Health Fair on May 3 from 9am to 3pm. Since I was one of the first 400 to register, I received two shirts (the same shirt, but one was purple and one was grey). This year, they offered women's cut, so that was an added bonus. Other than grabbing my bib number and shirts, I didn't stick around to look around the expo. For the most part, it's local businesses handing out free pens and information about their businesses, and it's usually the same groups there every year. Not too exciting, for me at least. The race was scheduled to start at 7, and we (my husband, mom, and I) got there around 6:30. The sky was threatening rain (it was grey and cloudy) at the start, but it turned out to be a perfect running day, in my opinion, at least. When we started, the temps were in the low- to mid-50s, and when I was finishing, the sun was out and it was in the mid-60s; sweaty yes, but not too uncomfortable. New to the race this year were pacers. There were 2 runners in each group, with completion times targeted at 1:35, 1:45, 1:50, 2:00, 2:10, 2:20 and 2:30. Running with a Pace Group was free, but you had to sign up for a Pace Group when you picked up your official packet at the Health Fair & Expo on Saturday. I'm not quick enough, so I did not run with any pacers. In fact, for the majority of the race, I was by myself (at least, on my side of the road). The race was an up and back, so while I was running one way, I was entertained watching the people coming back. I heard a lot of encouraging words from those people, and really appreciated the support and motivation. I don't know why anyone would be upset by encouraging words, but apparently, there are some people that either take it the wrong way, or just don't like it. I, for one, am not one of those people. I always love to get encouragement, and like to offer it when I can. Some would clap, while others said things like 'way to go', 'keep up the great work', and others acknowledged me by my number. So many great, encouraging people out there! Another new thing this year was a 10k race. That seemed to be popular, and started maybe 15 minutes after the half. At mile 2 the 10k runners had caught up to me, but they were out of my hair at mile 3 for their turnaround loop. I knew my cousin was running the half, so kept an eye out for him, and called out when I finally saw him. I'm so glad I was able to catch him and cheer him on. He had a great race. I also was able to high-five my husband as he was running back, on par to finish at his goal time (he ended up doing better than he planned – so proud!). I enjoy looking for certain people, because it takes my mind off of running and helps to clip off a few miles without me even noticing. I was feeling pretty good for the first half. I wore my pace band, and was actually ahead of schedule for the first 5 miles. Then came mile 6, and my stomach started to bother me (for whatever reason). I started feeling blisters coming on around mile 3 (excuse me?!). It was uncomfortable, but I powered through. I had been doing 2:1 run/walk intervals, but decided to do a little more walking until I felt better. I got to the turn around which is a little loop at about mile 6.5, and then passed the place where I actually DID get sick my first year running the race, which always makes me laugh thinking about (weird reaction, maybe). Anyway, I started to feel better, but didn't want to push so much I felt sick again, so changed my run walk intervals to 1:30 : 1. This worked pretty well. Then I got to mile 8, and my hip started to hurt. The pain continued on to the finish, but I did my best to keep up my run/walk intervals (I might have cheated and walked a few times when I should have been running, but I wanted to finish, not collapse from pain a few miles short of the finish), and finished with a time better than the goals I had set. When I hit mile 13, I started running and pushing to the finish, and once the finish line was in sight, I straight up booked it. I had looked at my watch and saw I was nearing the 3:05 mark, and really wanted to give a good push at the end to beat the clock. Before this race, my PR for a half was 3:18:52 (no judging, please haha), so my goals were: Goal A 3:05, Goal B 3:10 and Goal C 3:15. My official finish time was 3:03:42. Yaaay! All three of us ended up PRing that day, and that was a great feeling. Overall, I was really happy with my finish time, and now I'm really wanting to break the 3:00 barrier. I doubt that will happen this summer (I'm not a person that does well in the heat). The race itself was run well, and all of the volunteers were great. I appreciate that it isn't a huge race (I believe there were a little more than 1,000 runners for the half). When getting used to 10,000+ in the city races or 20,000+ at Disney, 1,000 seems like nothing. It honestly felt like a lot less; I was surprised when I saw the results and that there were that many people. There weren't any waves or corrals, but you could gauge where you should line up by using the pacers. I generally go out slower than most (though still faster than I should), so I just started at the back with my mom. They have plenty of aid stations (8), along with lots of water and Powerade (they did not run out, and even though I was one of the last few people out there, the volunteers were still there handing out drinks). There were 40 porto-lets, with 8 being on course (I never saw anyone in line or using them). Afterwards there were bananas and water bottles handed out, along with a band playing and you could purchase beer. We never have a problem with parking (there are a lot of parking lots for the companies surrounding the start/finish line, and it's free). Plus, who doesn't love a new shiny medal to add to the collection? 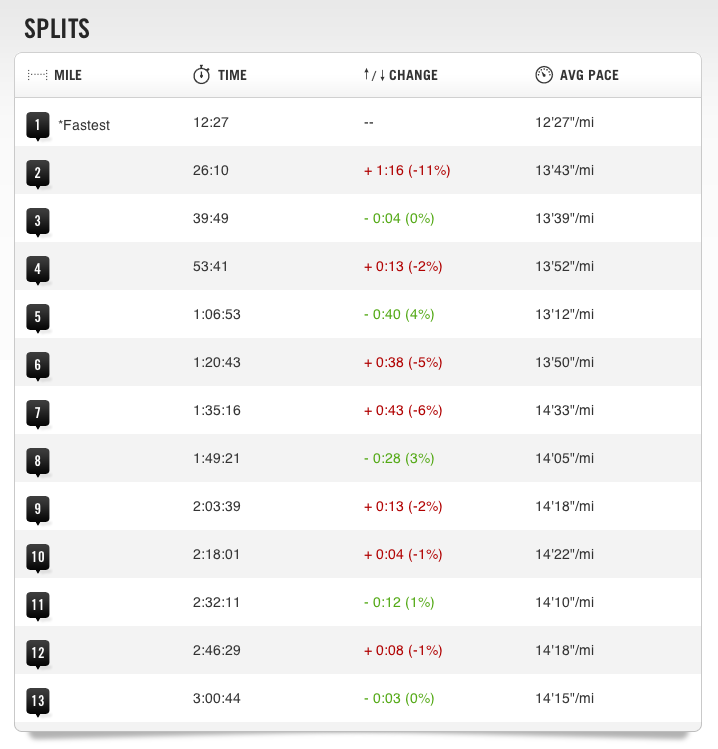 My splits from my Nike+ account. It's clear that I was having problems the second half of the race. The miles are slightly off, as my watch had me at 13.2 miles. I don't run as much over when there's only one turn haha. I'm obviously not the most consistent runner... oops. I have to mention two girls (well, young women, really) that were out there cheering people on. It's not the best race to spectate, because it can be hard to get to the course with the road closures. I ran by these girls around mile 5 or so, and they cheered for me and said they'd catch me on my way back. True to their word, once I had turned around and started back towards the finish, they were still there and said they told me they would see me again. This made me laugh, and gave me a boost of energy. And again, I saw them around mile 8 or 9, and they cheered for me again. They told me they were going to try and make the finish line, too, and as I ran to the finish line, I saw them on the sidelines cheering me on again. I pointed at them with a huge smile on my face, so happy to have the support of strangers. They seriously motivated me and helped keep my spirits up. It can be a lonely course when you are slow like me (it's not bad when I hang with my mom, because we keep each other company), and mostly the only interaction I have are with the volunteers at the aid stations. Sometimes, it's nice to be left to your thoughts, but I never dislike getting cheers from anyone. Afterwards, I just had to go up to them and thank them for the kindness and cheers, and let them know how much I appreciated it. They were so sweet. I'm pretty sure they were friends or family of someone that was a little behind me, which is why they were still out there, but either way, it was appreciated. Another great surprise at the finish was that my two girls (dogs) were there to greet me! My husband had worked it out so they would be there for me when I finished. Plus, it was great for them to get to mingle with people, they usualy don't get that opportunity much. Unfortunately, right when I was heading to the finish, he got up with them to be close to the finish line, and that's when people went over to talk to him about the dogs, so he missed my finish. Wah wah. Oh well, it was so great to give them hugs when I was done, happy with my finish, and they were happy to be somewhere new getting lots of attention. Remember how I mentioned the start of blisters forming at mile 3? When I got home and took off my shoes and socks, I had the worst blood blisters ever—well, not the worst, I looked up how to treat them and was horrified with the images that popped up. They were on the side of my foot, where the big toe connects to the foot (I think it's called the hallux–it's the place bunions are usually found). They were my first blood blisters, and I was very unhappy to have popped that cherry. I am quite familiar with the regular kind (I was an Irish Dancer for 20+ years, after all), but I had no idea how to deal with the blood kind. It was a shock too, because I had worn the socks and shoes before on long runs, plus used Body Glide, and never had such an issue before. What had changed? Was it the road and how it slants? Were my shoes tied a little differently than usual? Maybe my feet were more swollen than normal? I'm wondering if maybe I was dealing with slight injuries because most runs had still been done on treadmills rather than outdoors, due to the late winter we had, so my body wasn't used to the different terrain that slanted and had some potholes? Who knows the reason, but it was quite unpleasant. So now I'm on the hunt for the perfect new shoes and possibly socks. 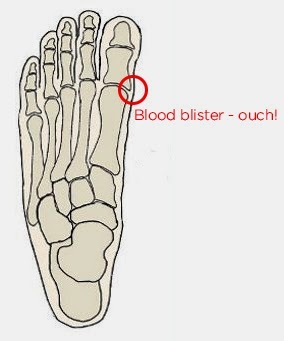 Any tips and tricks for blisters? Other than look into new shoes haha. 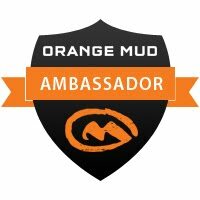 Do you have any races that hold a special place in your heart for a particular reason? Congrats on the PR! Sorry bout the hip pain and blister, ouch! 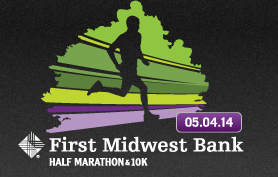 That is cool that they added a 10K this year! i use body glide and make sure my socks are breathable and wicking. i've heard moleskin works well for blisters but never tried it! Unfortunately for me, the Body Glide did not help that day, nor did the running socks. It was really frustrating! I tried moleskin afterwards, and it helped a bit :) I think for whatever reason, my shoes just aren't working for me anymore. Time for a new pair! Congratulations on the race, and great review:) But ouchy on the blisters! I rarely get them, but I use vasaline and cake it on my toes and feet before I put my socks on, it seems to do the trick. However, right now while your feet are sore, I highly recommend Moleskin.